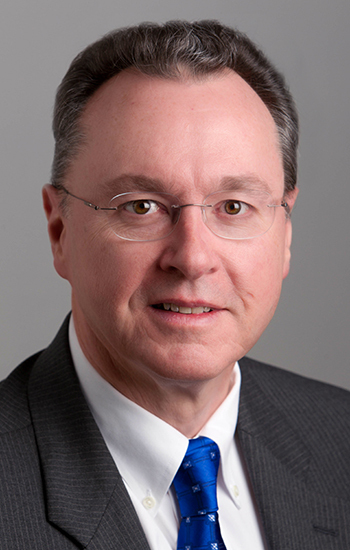 Dr. James M. O’Donnell was appointed as the eleventh Dean of the University at Buffalo School of Pharmacy and Pharmaceutical Sciences in October 2013. He is Professor of Pharmaceutical Sciences with a joint appointment as Professor of Pharmacology and Toxicology. He received his B.S. in Psychology from Carnegie Mellon University and Ph.D. in Pharmacological and Physiological Sciences from the University of Chicago; he completed postdoctoral training in Neuropsychopharmacology at the University of Pennsylvania. Prior to joining UB, he held research or faculty positions at Los Alamos National Laboratory, Louisiana State University, University of Tennessee, and West Virginia University; at WVU, he served as Associate Dean for Research in the School of Medicine and Assistant Vice President for Health Sciences Research. His research has focused on the relationship between the neurochemical and behavioral effects of drugs, primarily those used to treat neuropsychiatric illnesses. This has involved the study of noradrenergic mechanisms in the actions of antidepressant drugs and of cyclic nucleotide phosphodiesterases as potential targets for novel antidepressant, anxiolytic, and memory-enhancing drugs. This work has been supported by the NIH, primarily the National Institute of Mental Health, and has involved collaborations with scientists at other universities and biotech and pharmaceutical companies. Dr. O’Donnell has been active in the teaching of professional and graduate students in the areas of pharmacology and neuroscience and has provided research mentorship to undergraduate, graduate, and professional students, postdoctoral fellows, and junior faculty members. He served as Director of an NIGMS-supported, T32 predoctoral training grant at the interface of behavioral and biomedical sciences. He has served on NIH review panels in the neuroscience and drug discovery areas, including founding Chair of the Pathophysiological Basis of Mental Disorders and Addictions study section, and is Associate Editor for the Journal of Pharmacology and Experimental Therapeutics. He is a member of a number of scientific and professional societies, including the American Society for Pharmacology and Experimental Therapeutics and the Society for Neuroscience, is a Fellow of the American College of Neuropsychopharmacology, and chaired the Gordon Research Conference on Cyclic Nucleotide Phosphodiesterases. Ongoing Research: Research focuses on the relationship between the neurochemical and behavioral effects of drugs, primarily those used to treat neuropsychiatric illnesses. This work includes the study of noradrenergic mechanisms in the actions of antidepressant drugs and of cyclic nucleotide phosphodiesterases as potential targets for novel antidepressant, anxiolytic, and memory‐enhancing drugs. Chen L, Cui S, Yu H, Li G, Liu N, Wu Q, Zhang HT, O'Donnell JM, Wang G, Xu Y, O‘Donnell JM. Reduced phosphodiesterase-2 activity in the amygdala results in anxiolytic-like effects on behavior in mice. J Psychopharmacol. 2019. Poloyac SM, Cavanaugh JE, Hagemeier NE, Kumar K, Melchert RB, O'Donnell JM, Priefer R, Touchette DR, Farrell DF, Block KF, O‘Donnell JM. Breaking Down Barriers to Pharmacy Graduate Education: The Report of the 2017-2018 Research and Graduate Affairs Committee. Am J Pharm Educ. 2018; 82(7). Huang X, Xiaokaiti Y, Yang J, Pan J, Li Z, Luria V, Li Y, Song G, Zhu X, Zhang HT, O'Donnell JM, Xu Y, O‘Donnell JM. Inhibition of phosphodiesterase 2 reverses gp91phox oxidase-mediated depression- and anxiety-like behavior. Neuropharmacology. 2018. Zhang C, Xu Y, Chowdhary A, Fox D, Gurney ME, Zhang HT, Auerbach BD, Salvi RJ, Yang M, Li G, O'Donnell JM, O‘Donnell JM. Memory enhancing effects of BPN14770, an allosteric inhibitor of phosphodiesterase-4D, in wild-type and humanized mice. Neuropsychopharmacology. 2018. Xu Y, Zhu N, Xu W, Ye H, Liu K, Wu F, Zhang M, Ding Y, Zhang C, Zhang H, O'Donnell J, Pan J, O‘Donnell JM. Inhibition of Phosphodiesterase-4 Reverses AÎ²-Induced Memory Impairment by Regulation of HPA Axis Related cAMP Signaling. Front Aging Neurosci. 2018; 10. Shi J, Liu H, Pan J, Chen J, Zhang N, Liu K, Fei N, O'Donnell JM, Zhang HT, Xu Y, O‘Donnell JM. Inhibition of phosphodiesterase 2 by Bay 60-7550 decreases ethanol intake and preference in mice. Psychopharmacology (Berl). 2018. Huang XF, Jiang WT, Liu L, Song FC, Zhu X, Shi GL, Ding SM, Ke HM, Wang W, O'Donnell JM, Zhang HT, Luo HB, Wan YQ, Song GQ, Xu Y, O‘Donnell JM. A novel PDE9 inhibitor WYQ-C36D ameliorates corticosterone-induced neurotoxicity and depression-like behaviors by cGMP-CREB-related signaling. CNS Neurosci Ther. 2018. Liu L, Zheng J, Huang XF, Zhu X, Ding SM, Ke HM, O'Donnell JM, Zhang HT, Song GQ, Xu Y, O‘Donnell JM. The neuroprotective and antidepressant-like effects of Hcyb1, a novel selective PDE2 inhibitor. CNS Neurosci Ther. 2018. Poloyac SM, Block KF, Cavanaugh JE, Dwoskin LP, Melchert RB, Nemire RE, O'Donnell JM, Priefer R, Touchette DR. Competency, Programming, and Emerging Innovation in Graduate Education within Schools of Pharmacy: The Report of the 2016-2017 Research and Graduate Affairs Committee. Am J Pharm Educ. 2017; 81(8). Crabtree GW, Sun Z, Kvajo M, Broek JA, FÃ©nelon K, McKellar H, Xiao L, Xu B, Bahn S, O'Donnell JM, Gogos JA. Alteration of neuronal excitability and short-term synaptic plasticity in the prefrontal cortex of a mouse model of mental illness. J Neurosci. 2017. Zhang C, Lueptow LM, Zhang HT, O‘Donnell JM, Xu Y. The Role of Phosphodiesterase-2 in Psychiatric and Neurodegenerative Disorders. Adv Neurobiol. 2017; 17. Chong Zhang, Ying Xu, Han-Ting Zhang, Mark E. Gurney, James M. O‘Donnell. Comparison of the pharmacological profiles of selective PDE4B and PDE4D inhibitors in the central nervous system Scientific Reports. 2017; 7. Wang G, Chen L, Pan X, Chen J, Wang L, Wang W, Cheng R, Wu F, Feng X, Yu Y, Zhang HT, O'Donnell JM, Xu Y. The effect of resveratrol on beta amyloid-induced memory impairment involves inhibition of phosphodiesterase-4 related signaling. Oncotarget. 2016. Lueptow LM, Zhan CG, O'Donnell JM. Cyclic GMP-mediated memory enhancement in the object recognition test by inhibitors of phosphodiesterase-2 in mice. Psychopharmacology (Berl). 2016; 233(3). Wang ZZ, Yang WX, Zhang Y, Zhao N, Zhang YZ, Liu YQ, Xu Y, Wilson SP, O'Donnell JM, Zhang HT, Li YF, O‘Donnell JM. Phosphodiesterase-4D Knock-down in the Prefrontal Cortex Alleviates Chronic Unpredictable Stress-Induced Depressive-Like Behaviors and Memory Deficits in Mice. Sci Rep. 2015; 5. Xu Y, Pan J, Sun J, Ding L, Ruan L, Reed M, Yu X, Klabnik J, Lin D, Li J, Chen L, Zhang C, Zhang H, O'Donnell JM, O‘Donnell JM. Inhibition of phosphodiesterase 2 reverses impaired cognition and neuronal remodeling caused by chronic stress. Neurobiol Aging. 2015; 36(2). Zhang C, Yu Y, Ruan L, Wang C, Pan J, Klabnik J, Lueptow L, Zhang HT, O'Donnell JM, Xu Y, O‘Donnell JM. The roles of phosphodiesterase 2 in the central nervous and peripheral systems. Curr Pharm Des. 2015; 21(3). Xu Y, Wang C, Klabnik JJ, O'Donnell JM, O‘Donnell JM. Novel therapeutic targets in depression and anxiety: antioxidants as a candidate treatment. Curr Neuropharmacol. 2014; 12(2). Zhang C, Yu Y, Ruan L, Wang C, Pan J, Klabnik J, Lueptow L, Zhang HT, O'Donnell JM, Xu Y, O‘Donnell JM. The roles of phosphodiesterase 2 in the central nervous and peripheral systems. Curr Pharm Des. 2014; 21(3). Xu Y, Zhang L, Shao T, Ruan L, Wang L, Sun J, Li J, Zhu X, O'Donnell JM, Pan J, O‘Donnell JM. Ferulic acid increases pain threshold and ameliorates depression-like behaviors in reserpine-treated mice: behavioral and neurobiological analyses. Metab Brain Dis. 2013; 28(4). Xu Y, Pan J, Chen L, Zhang C, Sun J, Li J, Nguyen L, Nair N, Zhang H, O‘Donnell JM, O‘Donnell JM. Phosphodiesterase-2 inhibitor reverses corticosterone-induced neurotoxicity and related behavioural changes via cGMP/PKG dependent pathway. Int J Neuropsychopharmacol. 2013; 16(4). Yu Y, Wang R, Chen C, Du X, Ruan L, Sun J, Li J, Zhang L, O‘Donnell JM, Pan J, Xu Y, O‘Donnell JM. Antidepressant-like effect of trans-resveratrol in chronic stress model: Behavioral and neurochemical evidences. J Psychiatr Res. 2013; 47(3). Wang ZZ, Zhang Y, Liu YQ, Zhao N, Zhang YZ, Yuan L, An L, Li J, Wang XY, Qin JJ, Wilson SP, O'Donnell JM, Zhang HT, Li YF, O‘Donnell JM. RNA interference-mediated phosphodiesterase 4D splice variants knock-down in the prefrontal cortex produces antidepressant-like and cognition-enhancing effects. Br J Pharmacol. 2013; 168(4). Xu Y, Barish PA, Pan J, Ogle WO, O'Donnell JM, O‘Donnell JM. Animal models of depression and neuroplasticity: assessing drug action in relation to behavior and neurogenesis. Methods Mol Biol. 2012; 829. Kvajo M, McKellar H, Drew LJ, Lepagnol-Bestel AM, Xiao L, Levy RJ, Blazeski R, Arguello PA, Lacefield CO, Mason CA, Simonneau M, O'Donnell JM, MacDermott AB, Karayiorgou M, Gogos JA, O‘Donnell JM. Altered axonal targeting and short-term plasticity in the hippocampus of Disc1 mutant mice. Proc Natl Acad Sci U S A. 2011; 108(49). Xu Y, Li S, Vernon MM, Pan J, Chen L, Barish PA, Zhang Y, Acharya AP, Yu J, Govindarajan SS, Boykin E, Pan X, O'Donnell JM, Ogle WO, O‘Donnell JM. Curcumin prevents corticosterone-induced neurotoxicity and abnormalities of neuroplasticity via 5-HT receptor pathway. J Neurochem. 2011; 118(5). Li YF, Cheng YF, Huang Y, Conti M, Wilson SP, O'Donnell JM, Zhang HT, O‘Donnell JM. Phosphodiesterase-4D knock-out and RNA interference-mediated knock-down enhance memory and increase hippocampal neurogenesis via increased cAMP signaling. J Neurosci. 2011; 31(1). Xu Y, Zhang HT, O‘Donnell JM, O‘Donnell J. Phosphodiesterases in the central nervous system: implications in mood and cognitive disorders. 2011; (204). Masood A, Huang Y, Hajjhussein H, Xiao L, Li H, Wang W, Hamza A, Zhan CG, O'Donnell JM. Anxiolytic effects of phosphodiesterase-2 inhibitors associated with increased cGMP signaling. J Pharmacol Exp Ther. 2009; 331(2). Li YF, Huang Y, Amsdell SL, Xiao L, O'Donnell JM, Zhang HT. Antidepressant- and anxiolytic-like effects of the phosphodiesterase-4 inhibitor rolipram on behavior depend on cyclic AMP response element binding protein-mediated neurogenesis in the hippocampus. Neuropsychopharmacology. 2009; 34(11). Borysiewicz E, Fil D, Dlaboga D, O'Donnell JM, Konat GW. Phosphodiesterase 4B2 gene is an effector of Toll-like receptor signaling in astrocytes. Metab Brain Dis. 2009; 24(3). Zhao Z, Zhang HT, Bootzin E, Millan MJ, O'Donnell JM. Association of changes in norepinephrine and serotonin transporter expression with the long-term behavioral effects of antidepressant drugs. Neuropsychopharmacology. 2009; 34(6). Cashman JR, Voelker T, Zhang HT, O'Donnell JM. Dual inhibitors of phosphodiesterase-4 and serotonin reuptake. J Med Chem. 2009; 52(6). Zhang HT, Whisler LR, Huang Y, Xiang Y, O'Donnell JM. Postsynaptic alpha-2 adrenergic receptors are critical for the antidepressant-like effects of desipramine on behavior. Neuropsychopharmacology. 2009; 34(4). Zhao Z, Baros AM, Zhang HT, Lapiz MD, Bondi CO, Morilak DA, O'Donnell JM. Norepinephrine transporter regulation mediates the long-term behavioral effects of the antidepressant desipramine. Neuropsychopharmacology. 2008; 33(13). Masood A, Nadeem A, Mustafa SJ, O'Donnell JM. Reversal of oxidative stress-induced anxiety by inhibition of phosphodiesterase-2 in mice. J Pharmacol Exp Ther. 2008; 326(2). Zhang HT, Huang Y, Masood A, Stolinski LR, Li Y, Zhang L, Dlaboga D, Jin SL, Conti M, O'Donnell JM. Anxiogenic-like behavioral phenotype of mice deficient in phosphodiesterase 4B (PDE4B). Neuropsychopharmacology. 2008; 33(7). Dlaboga D, Hajjhussein H, O'Donnell JM. Chronic haloperidol and clozapine produce different patterns of effects on phosphodiesterase-1B, -4B, and -10A expression in rat striatum. Neuropharmacology. 2008; 54(4). Lapiz MD, Zhao Z, Bondi CO, O'Donnell JM, Morilak DA. Blockade of autoreceptor-mediated inhibition of norepinephrine release by atipamezole is maintained after chronic reuptake inhibition. Int J Neuropsychopharmacol. 2007; 10(6). Hajjhussein H, Suvarna NU, Gremillion C, Chandler LJ, O'Donnell JM. Changes in NMDA receptor-induced cyclic nucleotide synthesis regulate the age-dependent increase in PDE4A expression in primary cortical cultures. Brain Res. 2007; 1149. Zhang HT, Huang Y, Mishler K, Roerig SC, O'Donnell JM. Interaction between the antidepressant-like behavioral effects of beta adrenergic agonists and the cyclic AMP PDE inhibitor rolipram in rats. Psychopharmacology (Berl). 2005; 182(1). O'Donnell JM, Marek GJ, Seiden LS. Antidepressant effects assessed using behavior maintained under a differential-reinforcement-of-low-rate (DRL) operant schedule. Neurosci Biobehav Rev. 2005; 29(4-5). Zhang HT, Zhao Y, Huang Y, Dorairaj NR, Chandler LJ, O'Donnell JM. Inhibition of the phosphodiesterase 4 (PDE4) enzyme reverses memory deficits produced by infusion of the MEK inhibitor U0126 into the CA1 subregion of the rat hippocampus. Neuropsychopharmacology. 2004; 29(8). O'Donnell JM, Zhang HT. Antidepressant effects of inhibitors of cAMP phosphodiesterase (PDE4). Trends Pharmacol Sci. 2004; 25(3). Zhao Y, Zhang HT, O'Donnell JM. Antidepressant-induced increase in high-affinity rolipram binding sites in rat brain: dependence on noradrenergic and serotonergic function. J Pharmacol Exp Ther. 2003; 307(1). Zhang HT, Huang Y, O'Donnell JM. Antagonism of the antidepressant-like effects of clenbuterol by central administration of beta-adrenergic antagonists in rats. Psychopharmacology (Berl). 2003; 170(1). Zhang HT, Huang Y, Jin SL, Frith SA, Suvarna N, Conti M, O'Donnell JM. Antidepressant-like profile and reduced sensitivity to rolipram in mice deficient in the PDE4D phosphodiesterase enzyme. Neuropsychopharmacology. 2002; 27(4). Crissman AM, O'Donnell JM. Effects of antidepressants in rats trained to discriminate centrally administered isoproterenol. J Pharmacol Exp Ther. 2002; 302(2). Suvarna NU, O'Donnell JM. Hydrolysis of N-methyl-D-aspartate receptor-stimulated cAMP and cGMP by PDE4 and PDE2 phosphodiesterases in primary neuronal cultures of rat cerebral cortex and hippocampus. J Pharmacol Exp Ther. 2002; 302(1). Makhay MM, Houslay MD, O'Donnell JM. Discriminative stimulus effects of the type-4 phosphodiesterase inhibitor rolipram in rats. Psychopharmacology (Berl). 2001; 158(3). Ye Y, Jackson K, Houslay MD, Chandler LJ, O'Donnell JM. Development of rolipram-sensitive, cyclic AMP phosphodiesterase (PDE4) in rat primary neuronal cultures. Brain Res Dev Brain Res. 2001; 130(1). Farooqui SM, Al-Bagdadi F, Houslay MD, Bolger GB, Stout R, Specian RD, Cherry JA, Conti M, O'Donnell JM. Surgically induced cryptorchidism-related degenerative changes in spermatogonia are associated with loss of cyclic adenosine monophosphate-dependent phosphodiesterases type 4 in abdominal testes of rats. Biol Reprod. 2001; 64(6). Crissman AM, Makhay MM, O'Donnell JM. Discriminative stimulus effects of centrally administered isoproterenol in rats: mediation by beta-1 adrenergic receptors. Psychopharmacology (Berl). 2001; 154(1). Zhang HT, Crissman AM, Dorairaj NR, Chandler LJ, O'Donnell JM. Inhibition of cyclic AMP phosphodiesterase (PDE4) reverses memory deficits associated with NMDA receptor antagonism. Neuropsychopharmacology. 2000; 23(2). Zavecz JH, Bueno O, Maloney RE, O'Donnell JM, Roerig SC, Battarbee HD. Cardiac excitation-contraction coupling in the portal hypertensive rat. Am J Physiol Gastrointest Liver Physiol. 2000; 279(1). Zhang HT, O'Donnell JM. Effects of rolipram on scopolamine-induced impairment of working and reference memory in the radial-arm maze tests in rats. Psychopharmacology (Berl). 2000; 150(3). Farooqui SM, Zhang K, Makhay M, Jackson K, Farooqui SQ, Cherry JA, O'Donnell JM. Noradrenergic lesions differentially alter the expression of two subtypes of low Km cAMP-sensitive phosphodiesterase type 4 (PDE4A and PDE4B) in rat brain. Brain Res. 2000; 867(1-2). Ye Y, Jackson K, O'Donnell JM. Effects of repeated antidepressant treatment of type 4A phosphodiesterase (PDE4A) in rat brain. J Neurochem. 2000; 74(3). Zhang K, Farooqui SM, Jackson KT, O'Donnell JM. Effects of noradrenergic lesions on the development of rolipram-sensitive, low-K(m), cyclic AMP specific phosphodiesterase in rat brain. Brain Res Dev Brain Res. 1999; 116(2). Makhay MM, O'Donnell JM. Effects of antidepressants in rats trained to discriminate the beta-2 adrenergic agonist clenbuterol. Pharmacol Biochem Behav. 1999; 63(2). O'Donnell JM, Frith S. Behavioral effects of family-selective inhibitors of cyclic nucleotide phosphodiesterases. Pharmacol Biochem Behav. 1999; 63(1). Zhang K, Farooqui SM, O'Donnell JM. Ontogeny of rolipram-sensitive, low-K(m), cyclic AMP-specific phosphodiesterase in rat brain. Brain Res Dev Brain Res. 1999; 112(1). Ye Y, Conti M, Houslay MD, Farooqui SM, Chen M, O'Donnell JM. Noradrenergic activity differentially regulates the expression of rolipram-sensitive, high-affinity cyclic AMP phosphodiesterase (PDE4) in rat brain. J Neurochem. 1997; 69(6). O'Donnell JM. Pharmacological characterization of the discriminative stimulus effects of clenbuterol in rats. Pharmacol Biochem Behav. 1997; 58(3). Farooqui SM, Al-Bagdadi F, O'Donnell JM, Stout R. Degenerative changes in spermatogonia are associated with loss of glucose transporter (Glut 3) in abdominal testis of surgically induced unilateral cryptorchidism in rats. Biochem Biophys Res Commun. 1997; 236(2). Zhang K, O'Donnell JM. Antisense oligonucleotides fail to inhibit the expression of central beta adrenergic receptors. Res Commun Mol Pathol Pharmacol. 1997; 95(1). Ye Y, O'Donnell JM. Diminished noradrenergic stimulation reduces the activity of rolipram-sensitive, high-affinity cyclic AMP phosphodiesterase in rat cerebral cortex. J Neurochem. 1996; 66(5). Murugaiah KD, O'Donnell JM. Beta adrenergic receptors facilitate norepinephrine release from rat hypothalamic and hippocampal slices. Res Commun Mol Pathol Pharmacol. 1995; 90(2). Murugaiah KD, O'Donnell JM. Facilitation of noradrenaline release from rat brain slices by beta-adrenoceptors. Naunyn Schmiedebergs Arch Pharmacol. 1995; 351(5). Zavecz JH, Battarbee HD, O'Donnell JM. Cardiac beta-adrenoceptor-effector coupling in portal vein-stenosed rats. Am J Physiol. 1995; 268(3 Pt). Murugaiah KD, O'Donnell JM. Facilitation of norepinephrine release from cerebral cortex is mediated by beta 2-adrenergic receptors. Life Sci. 1995; 57(20). Murugaiah KD, O'Donnell JM. Clenbuterol increases norepinephrine release from rat brain slices by a calcium- and receptor-independent mechanism. Res Commun Mol Pathol Pharmacol. 1994; 86(3). O'Donnell JM, Frith S, Wilkins J. Involvement of beta-1 and beta-2 adrenergic receptors in the antidepressant-like effects of centrally administered isoproterenol. J Pharmacol Exp Ther. 1994; 271(1). O'Donnell JM. Reduced locomotor activity of rats mediated by peripheral beta adrenergic receptors. Res Commun Chem Pathol Pharmacol. 1993; 82(3). O'Donnell JM. Effect of the beta-2 adrenergic agonist zinterol on norepinephrine turnover. Res Commun Chem Pathol Pharmacol. 1993; 80(1). O'Donnell JM. Antidepressant-like effects of rolipram and other inhibitors of cyclic adenosine monophosphate phosphodiesterase on behavior maintained by differential reinforcement of low response rate. J Pharmacol Exp Ther. 1993; 264(3). O'Donnell JM. Effects of the beta-2 adrenergic agonist zinterol on DRL behavior and locomotor activity. Psychopharmacology (Berl). 1993; 113(1). O'Donnell JM. Behavioral effects of beta adrenergic agonists and antidepressant drugs after down-regulation of beta-2 adrenergic receptors by clenbuterol. J Pharmacol Exp Ther. 1990; 254(1). Hjeresen DL, Francendese A, O'Donnell JM, O‘Donnell JM. Microwave attenuation of ethanol-induced interactions with noradrenergic neurotransmitter systems. Health Phys. 1989; 56(5). McElroy JF, Stimmel JJ, O'Donnell JM. Effects of centrally acting beta adrenergic agonists on discrete trial conditioned avoidance behavior in rats. Psychopharmacology (Berl). 1989; 97(1). O'Donnell JM. Behavioral consequences of activation of beta adrenergic receptors by clenbuterol: evidence for mediation by the central nervous system. Brain Res Bull. 1988; 21(3). Fowler JC, O'Donnell JM. Antagonism of the responses to isoproterenol in the rat hippocampal slice with subtype-selective antagonists. Eur J Pharmacol. 1988; 153(1). O'Donnell JM. Psychopharmacological consequences of activation of beta adrenergic receptors by SOM-1122. J Pharmacol Exp Ther. 1988; 246(1). Hjeresen DL, Francendese A, O'Donnell JM, O‘Donnell JM. Microwave attenuation of ethanol-induced hypothermia: ethanol tolerance, time course, exposure duration, and dose response studies. Bioelectromagnetics. 1988; 9(1). O'Donnell JM. Effects of clenbuterol and prenalterol on behavior maintained under a multiple fixed-interval, fixed-ratio schedule. J Pharmacol Exp Ther. 1987; 242(2). O'Donnell JM. Effects of clenbuterol and prenalterol on performance during differential reinforcement of low response rate in the rat. J Pharmacol Exp Ther. 1987; 241(1). Ordway GA, O'Donnell JM, Frazer A. Effects of clenbuterol on central beta-1 and beta-2 adrenergic receptors of the rat. J Pharmacol Exp Ther. 1987; 241(1). O'Donnell JM, Frazer A. Effects of clenbuterol and antidepressant drugs on beta adrenergic receptor/N-protein coupling in the cerebral cortex of the rat. J Pharmacol Exp Ther. 1985; 234(1). O'Donnell JM, Seiden LS. Effect of the experimental antidepressant AHR-9377 on performance during differential reinforcement of low response rate. Psychopharmacology (Berl). 1985; 87(3). O'Donnell JM, Seiden LS. Altered effects of desipramine on operant performance after 6-hydroxydopamine-induced depletion of brain dopamine or norepinephrine. J Pharmacol Exp Ther. 1984; 229(3). O'Donnell JM, Wolfe BB, Frazer A. Agonist interactions with beta adrenergic receptors in rat brain. J Pharmacol Exp Ther. 1984; 228(3). O'Donnell JM, Seiden LS. Effects of monoamine oxidase inhibitors on performance during differential reinforcement of low response rate. Psychopharmacology (Berl). 1982; 78(3). O'Donnell JM, Rider DP, Somani S, Seiden LS. The effect of repeated desipramine administration on water intake in rats. Psychopharmacology (Berl). 1982; 77(2). O'Donnell JM, Miczek KA. No tolerance to antiaggressive effect of d-amphetamine in mice. Psychopharmacology (Berl). 1980; 68(2). Miczek KA, O'Donnell JM. Alcohol and chlordiazepoxide increase suppressed aggression in mice. Psychopharmacology (Berl). 1980; 69(1). Miczek KA, O'Donnell JM. Intruder-evoked aggression in isolated and nonisolated mice: effects of psychomotor stimulants and L-dopa. Psychopharmacology (Berl). 1978; 57(1). O‘Donnell J.M., Bies, R.R., Shelton, R.C.. Chapter 15: Drug therapy of depression and anxiety disorders. Goodman and Gilman‘s The Pharmacological Basis of Therapeutics. 2017. Zhang, HT, Xu, Y., O‘Donnell JM (editors). Phosphodiesterases: CNS Functions and Diseases. Advances in Neurobiology. 2017; 17.